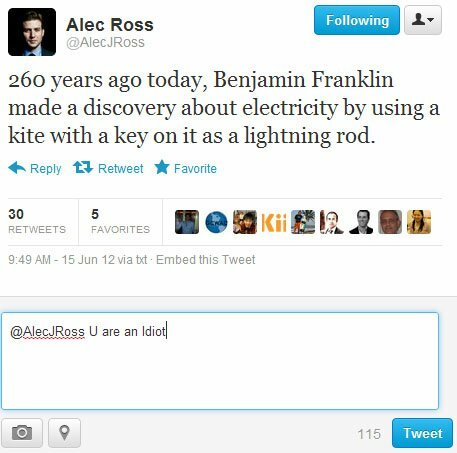 If, as seems inferable, the purpose of that tweet was to remind the world of American scientific and technological prowess, would it be churlish to mention that 167 years after Franklin died the Russian Communists sent the first satellite into space? And then there was Gagarin. Not to be sophomoric though. I leave that to those uniquely qualified. BTW, another Fun Fakt: The words “sophomore” and “sophomoric” are derived from combining the ancient Greek words for “wise” (sophos) and “fool” (moros, cf moron.) In other words an educated fool. With that kind of high praise (sounds self-written), I can see why he is where he is. Insightful. Actually, he probably would not have given a crap about the British b/c he’d have been a Facebook addict playing Farmville all day. I can just imagine the dictators of the world fuming over his “support”. “Hillaryous.” Ross was probably promoting the Franklin Fellows Program (http://careers.state.gov/ff), named in honor of the founding father of the US Foreign Service. And because Dr. Franklin promoted frugality and thrift, the Franklin Fellows Program is one of those yearlong free labor programs where the State Department does not pay one penny for one’s services. A penny saved is a penny earned. They can’t pay because all of their freakin’ money has been spent on useless projects like the world’s largest embassy in Iraq. Smart power! Rah, rah, rah! I guess I’m one of the lucky ones whose tweets DID get read by Alec J Ross (the 21st century Rasputin, the 21st century Elmer Gantry, the 21st century…well, you get the picture) and it got him to quickly BLOCK both my twitter accounts. Mr. China-Is-Scared-Of-Me, Mr. Bad-Time-To-Be-A-Control-Freak blocked little ole me. And all I do is tweet-ask him how much his luxury vacations to “yammer” at small groups of people cost the US Taxpayers. Go figure! Guess he’s temperamental. I am very, very, very relieved to see others rejecting this disgraceful hypocrite. It gives me hope for the State Department. Thank you! Amazing my tax dollars at work, Oh right I don’t pay taxes because I’m to poor. I guess this his reward for being a good little puppet. Just wonderful, Peter, and thank you so much for sharing. We can all endeavor to raise the level of dialog thru the considered example of Mr. Ross. Drone land inhabitants and, in fact, entire countries of the Middle East might have a bone of contention with our “more humble foreign policy” and our other than “unilateral” projection of empire. If you have something to say to the boy wonder of State’s lame and laughable social media outreach efforts, drop him a line at RossAJ@state.gov. After all, Alec works for you, doesn’t he? May his inbox runneth over!